These dishes are listed as appetisers at Madam Kwan Restaurant and we ordered them to share between the 4 of us. Beef satay aka skewered BBQ beef served with peanut sauce, raw onions, cucumber, pineapple, compressed rice at MYR17.90++ (MYR20.90 nett) for 6 sticks per portion. Otak otak aka Fish meat with spices grilled in banana leaf at MYR19.90++ (MYR23.20 nett) and chicken satay aka skewered BBQ chicken meat served with peanut sauce, raw onions, cucumber, pineapple, compressed rice at MYR14.90++ (MYR17.40 nett) for 6 sticks per portion. 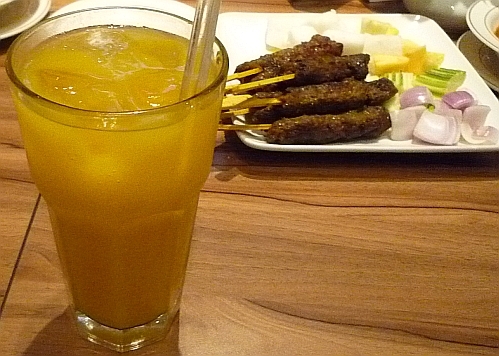 The drink I ordered - Fresh Mango Juice - MYR10.90++ (MYR12.70 nett). I can't tell whether it is pure fresh mango juice or not because it tasted like it has some mango cordial in it. 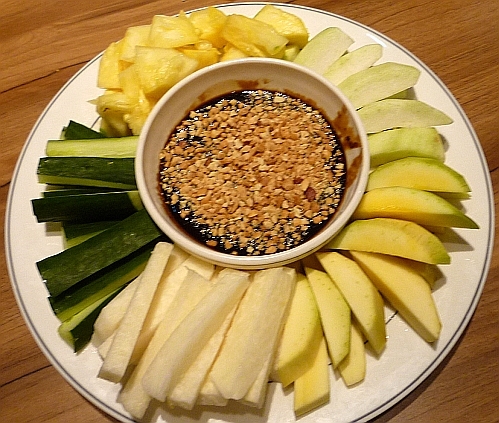 Fruit Rojak aka local fruits served with peanuts and shrimp paste sauce at MYR14.90++ (MYR17.40 nett) with crackers. 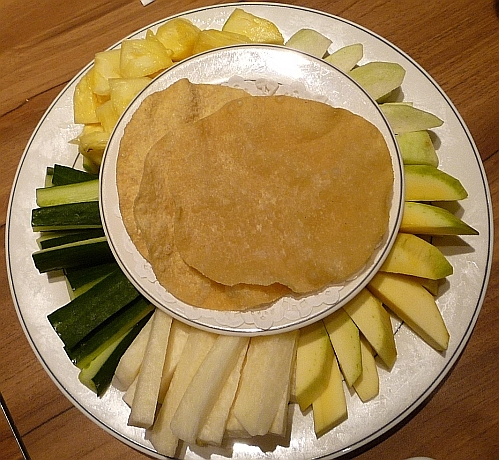 After the plate of crackers has been removed, the saucer of peanuts and shrimp paste sauce is revealed. There are sticks of cucumber, jicama, pineapple, mango and ambarella. Some of us take the fruits and mix them with the sauce on our own plates and some of us just take some sauce and fruits and dip the fruits in the sauce before eating. I just ate the fruits as they are without the sauce. Since that day I ate the above satay, I also did not eat any satay. Madam Kwan! Have always wanted to go and give it a try, never got round to it. Must do it next time I go over to KL! 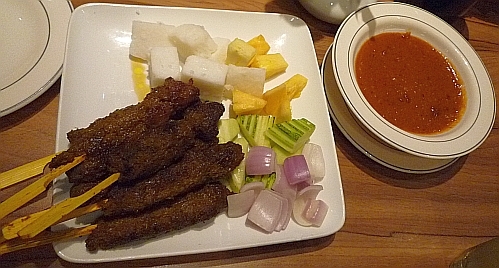 The plate of rojak is a nice presentation with neatly arranged cuts. Madam Kwan is one of the best local restaurants with good service and dishes. My foreign guests often loved the food and ambiance. This friendly Madam Kwan still goes shopping often in the malls and many passer-by could easily spot her signature look with the same hat! I have seen her, a pretty little old lady with a hat at Madam Kwan in Pavilion. I agree that this is a place to bring your friends from overseas who are visiting you to eat local food in a comfortable place. The last plate! i know that they are just so healthy! i love pineapples and peanuts please! If don't dip in the sauce, then is really healthy. Madam Kwan still continues to serve good food till today. Never tried their satay coz I find it on the pricey side (and I can get better ones at roadside stalls). I think their juices is a combination of fresh fruit and chilled juices too. Yes, if you can get better and cheaper satay, then no need to eat here. I find this place is good for tourists to try all our local food. When I ordered it, I asked whether it is fresh mango and the person taking the order kept insisting it is fresh mango. I also don't want to argue so much since I can't tell for sure when I drank it so just let it slide. It's a good idea to just order appetizers because you can sample more varieties since the servings are small. I've never tried Madam Kwan. True, we can get to sample more but mainly it is because the price is high and we can get similar food elsewhere. I think there is no need for locals to eat here as we can get equal tasty food in places that are not so comfortable unless the other restaurants are full or even more expensive. I enjoyed the satay there and other stuff are mostly good. There's usually a long queue at their outlets so I rarely go. I find their prices are on the high side so I also seldom eat here except if I want to eat their famous Nasi Bojari. So much otak-otak there, but I prefer those otak-otak that serve in small portion, hehe! Where did you eat those otak-otak in small portion? I would have enjoyed the meal above ( minus the price lol!). The last time I went to Mdm Kwan I was still working 16+ years ago!!! Don't think I'll go there anytime soon either ..too pricey! For locals, no need to specially go there unless you are meeting up with your friends in that shopping mall and have no other place to eat or you bring your friends from overseas there.